Take the exhaustion out of teaching your pup to heel with the EzyDog Black Mongrel Dog Leash! 3-point, load dispersing comfort handle with rubber grip. Use with Mongrel Leash Extension (sold separately) for a longer leash option. 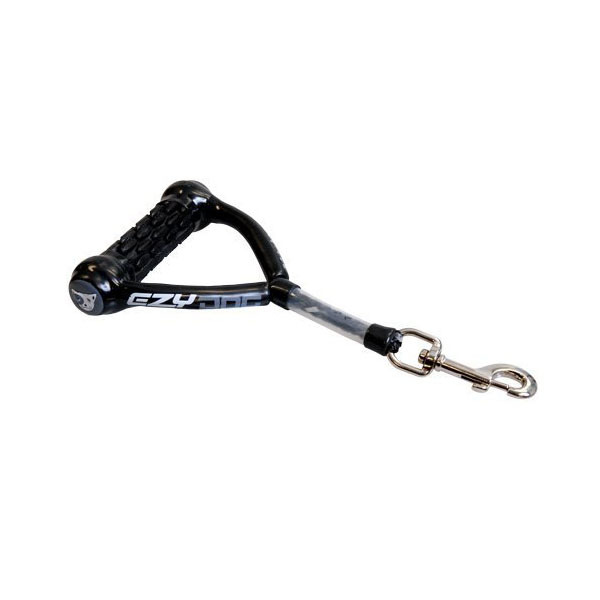 The 12" Mongrel Dog Leash features EzyDog's signature 3-point, load dispersing handle for a strong grip! The design takes away uncomfortable hand pinching and provides a comfortable fit for owner and dog. This leash is great for teaching a dog how to heel or when you need your pooch to stay close on the busy sidewalk. Look for the Mongrel Dog Leash Extensions for added freedom (sold separately). Posted On 10/08/15 by Lacy J from , Yes, Lacy J recommends this product! i love this little handle. it is great for when i go running with my dog. she heels next to me the entire time but if a biker, or another person come by, i can quick grab this leash without having to stop and not get any grief from anyone for "not having her on a leash" it fits perfect between her collar and it not uncomfortable for her while running. Love all the adorable stuff baxterboo offers at affordable prices!t affordable prices!